Walt scanned the water intently as he walked. I followed behind, stumbling on a bank side rock and almost falling down trying to keep up. The creek in this spot was about 100 feet wide and the water was around 5 feet deep out in the middle. Walt went up to the top of the run in front of the shallow riffle and sat down on a fallen log and pulled the worn fly box from his vest pocket. “This is a perfect night to try and fool one up to the surface Anders,” he said as he withdrew a heavily hackled dry fly from the clip inside. “I call it the Meadow Muffin” Walt continued. “You name your flies Walt? I said inquisitively. Well yeah, a flies gotta have a name don’t it kid? He grabbed the leader from the fly line on the already strung rod and clipped the wet fly off and stuck it in his hat, quickly threading on the new dry fly in it’s place. He tied the fly on in an interesting way. After tying a simple clinch knot, he took the line and put a half hitch in it and slipped it over the eye of the fly and secured the hitch directly under the center of the eye. All of this was new to me, fly rods, steelhead, bushy dry flies, riffle hitching, tension on the line; Walt may have just as well been speaking Chinese. I just wanted to watch him cast the fly line and see what this was all about. He then greased the dry fly with something out of a small jar and walked to a small rock outcropping that allowed him to be slightly above the water without getting wet. Wordlessly he pulled line slowly from the reel, the gears and pawl growling low. After he had a little line off the reel he cast the line slightly down stream and the fly landed lightly and came under tension and waked across the surface of the fast, upper part of the run. When it got down stream of him he pulled a bit more line off and repeated the cast. Soon he was casting around 50 feet of line, and it was a sight to behold. There was no wasted motion as he pulled the line off the water at the end of the cast and flipped the whole thing behind him in a smooth fluid motion. 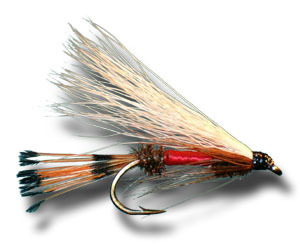 Once the line was straight behind him he brought the rod forward, pulling down on the line in his left hand and sending the line out over the water in a tight loop, the fly neatly turning over at the end of the cast, line and fly landing straight and coming under tension immediately. It was a mesmerizing dance of man and fly rod; it was a beautiful thing to watch. Walt had now made his way to the middle of the run, the water had slowed and there was more depth to the water. Rather than the fast, tumultuous water of the head of the run, the water now was flatter, glass like and swirly at times. The surface water shimmered with the influence of the many boulders just under the surface. Walt’s fly skittered and danced across the water like a water skeeter, pausing slightly at times only to be torn away by a puff of water to continue it’s down and across arc. Again and again he cast as he slowly moved down the piece of rock he was standing on. “Ah, it feels good to get out here again and cast” he said after some time. After the wife passed I just never……..” his voice trailed off without finishing. I didn’t really know what to say, but could relate to what he was feeling for sure, what with my Dad being gone too. I started to think of my Dad again as I watched Walt cast. I fought with my own emotions in that moment, trying to keep it together but I just wanted to cry. Luckily Walt broke the tension with an excited yell. “Did you see that?” Walt squealed in a voice I had not expected from a 70 year old. I had to admit I had no idea what he was talking about, my mind had drifted to thoughts of my father, the river and what was happening in front of me went out of focus briefly. Snapped back to reality with Walt’s exclamation, I turned and looked to see where he was pointing. “I just rose a steelhead right over there, right off that break on the far side where that log is laid in the water. I had a feeling he would be there!” Walt then started to pull in his line but did not recast. “Whatcha gonna do now Walt?” I said, having no clue what had actually happened, or what raising a steelhead even was. My thought was it was a good thing as that’s the fish he was chasing. I expected to see him send the fly back over to the lie and catch the fish. “What did he do, I was daydreaming and missed it.” I said awkwardly, kicking myself for not watching the whole drift of the fly. Walt pulled out his pipe and stuffed it full, lighting it with the flick of a match across the leg of his jeans. He took several long draws on it before he continued. “Pay attention here son, I’m trying to teach ya something. Ya can’t go drifting off into Candy Land and expect to learn anything about fishing. This is important stuff I’m trying to show ya!” He said gruffly. Walt sat down on a corner of the out cropping he was walking down and leaned back against the smooth stone, worn and weathered from a thousand storms. The sun dropped on the horizon and the last rays disappeared behind a big sugar pine tree. I looked over in the field next to the creek and noticed the big mule hadn’t wandered far. The waist high grass kept him plenty busy eating to his hearts contentment. Walt puffed on the pipe a few more times and then knocked it out on the heel of his boot, the embers fairly glowing in the fading light. He stood again and regained his position on the rock. The line was coiled up on the rock in a pile, waiting to be recast. The length was the exact distance where the fish rose. “Imma gonna give it right back to him, same distance as before and see if I can get him to chase it” Walt said, excitedly. I wasn’t gonna miss a thing this time. I watched intently as Walt gathered the line from the rock in his left hand and made one false cast backward then forward adding about half the line. In one more move backwards he added the rest of the line and sent it out over the water in a perfect arc. Before the line hit the water he reached upstream and flipped the line straight, the fly then landed light as a feather and started to wake. My eye was tracking the fly as it neared the soft inside seam below the log, the water was glassy and flat and quite clear. I saw a large shadow moving quickly toward the fly, it was the steelhead for sure. The fish slowed as it got nearer and then came behind the fly, rising to the surface slowly then refusing the fly again in with a flash of its body. A slight bulge of water was all that was left on the surface. The fish returned back to it’s lie and the fly continued to swing. He stripped the fly line in through his weathered hands again dropping it in loose coils at his feet. 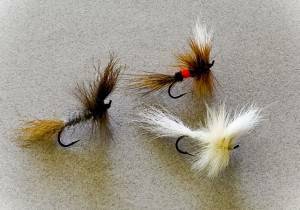 He grabbed the end of the leader and with his teeth he nipped off the deer hair fly and placed it in his hat. He pulled the small wet fly that he had attached to his hat earlier and tied it on. Walt wound up about 10 feet of line off the rock with a few turns of the reel. “That’s right son, I’ll be a bit short but I want to slip it down to him a couple feet at a time now. I’m gonna re-cover the water a little above him and let him settle again. When he sees this little Coachman, he’s done. Walt started in casting again and even a little shorter still, holding some line back in his left hand on the first drift. The fly was so small I could not see it and I followed the fly line as it swung, imagining about where the fly would be. Another cast and drift still 10 feet short of the lie. The next cast fell about 7 or 8 feet short of the lie and started to swing, suddenly there was a large boil and Walt’s line went tight, snapping against the guides, the old Hardy paying out line in short staccato bursts. The fish was taking line fast and jumped several times. It was a steelhead of 6-7lbs and it was beautiful. Walt played the fish wonderfully but he had gotten to the end of the rock outcropping and could not chase him without getting wet. The fish jumped two more times and spit the hook, the once taught line now laying limp in the slack water on the edge of the creek. Walt threw his head back and was yelling and hooting like a crazy man. I had no idea a fish could make a man act like that. Yahoooooooooooo! His big voice boomed of the canyon walls with pure joy. I too was caught up in the moment. I had just witnessed a fish that would change my life. The reel was beautiful. It had a worn look on the leaden finish that told of years of loving use. I grabbed the reel off the table when he laid it down. He quietly crossed the room to toss a couple logs on the fire in the stove. The big stove creaked as he opened the door, the heavy cast iron door swung wide as the inviting fire light from inside flickered on the old Indian woven carpet on the floor. I continued to look at the reel in my hands. 3 3/4 “ Hardy “Perfect” Salmon Wide Spool it read on the side. Hardy’s- Alnwick –Patent was written in a semi circle around the hub. A smooth brass reel foot was attached to the reel and there was an ivorine knob on the reel handle. I looked up to the ceiling and recognized the same kind of reel was on many of the rods that were resting on the rack. “Hey I want to show you something out back,” Walt said suddenly. He got up abruptly and headed to the small door at the far end of the room that led to the back of the shop. Smoke from his pipe trailed behind him as I hurriedly swallowed the last of my Coke and followed him out the door. I was a bit behind as I rounded the corner of the shop and found myself in front of the home built smoke house. Walt was inside mumbling about this and that, the smell of smoked meat and fish was intoxicating. There were piles of split alder, apple, peach,oak and cherry stacked at the entrance and the smoke from the fire inside was seeping through the gaps in the walls. I approached the doorway and could see Walt had drawn his knife in a flash from the leather pouch on his hip. He expertly carved a small piece off the bottom of the hanging ham in front of him took a quick taste and handed me a piece. “I’d say that is perfectly done” Walt said smiling with delight. I took the morsel in my hand and quickly popped it in my mouth, the flavor was amazing and I immediately smiled my approval. Walt was watching for my reaction and saw my eyes light up and when they did, his did too. “Told ya!” He said with a laugh. I had to agree it was good but the thought of slapping my Mom’s hand had me thinking I’d end up getting slapped myself. “Did you raise that hog yourself”, I said as my eyes scanned the back fourty and noticed a few animals running around back there. A particularly large boar wallowed in the mud by the fence under the pine trees. “Wow, that’s neat!” I said as I reached out to pet the big lab that appeared out of nowhere knowing we were at the smoke house. “This is Shep” Walt said. Reaching over to scratch the head of the 110 lb lab. Walt disappeared into the shop and came out with a fly rod of around 8 ½ feet. It had a Hardy reel on it and was strung up with what looked like a big bushy dry fly. A bit bigger fly than what I had seen other guys trout fish with. He also had a small metal fly box and a spool of tippet, both of which he slipped into his vest pocket. “ I ain’t walking down there, lets take the mule!” Walt said as he headed towards the barn. He clucked his cheeks together twice and a huge mule came over to him. He gave him a small flake of alfalfa from a nearby bail and gathered the bit and reins of the hook on the wall of the tack room. “That’s Pete” Walt said as he threw a beautiful blanket across the back of the huge animal. He expertly fitted the bit into the mouth of the still chewing Pete and threw the reins over his head until they rested on his mane. “Here hold this rod while I jump on” Walt said as he climbed the rail corral to get high enough to throw a leg over the gentle giant before us. I grabbed the rod as he climbed aboard; Pete was fighting the bit a little as he was still eyeballing that flake of hay. I climbed on the rail as I saw Walt do and when he motioned to me,he extended his arm and I swung around and sat on the back of the mule behind him. “Now this is traveling in style,” Walt said as he clucked his cheeks again and gave Pete a gentle nudge with his boots. Pete responded and moved ahead with the steady gate of an experienced mount. It was probably a mile and a half to where Walt wanted to go and I was on back just enjoying the ride. The late Indian summer sun was still high in the sky. We meandered through the upper meadow, Walt pointing out and naming everything he saw. As we rode Walt continues with story after story of his exploits on the ranch. It was a wild and wondrous place for a kid like me. The cares of the world, school, chores, and all the rest melted away. The steady plodding of the big mule was comforting; he barely felt our weight on his back. After a few minutes we rounded a patch of madrone and I could see the creek. This was the part I never could get up the nerve to sneak into. It was actually pretty big here, a nice riffle at the top broadened out into a perfect glide filled with rocks and boulders, the water slowing and deepening as it went. It was several hundred yards long and Walt was looking at a particular section as we drew nearer.